Still cold and grey today. I went across the road to a little remnant of woodland I call the ‘Scrap Woods’, a scrap of ancient woodland in between all the houses. It does have a proper name, ‘Bentsley Spinney’ I found out recently. The paths where slippery and muddy with the rain. I took a little sketching chair with me and the legs sank into the mud as I sat there! 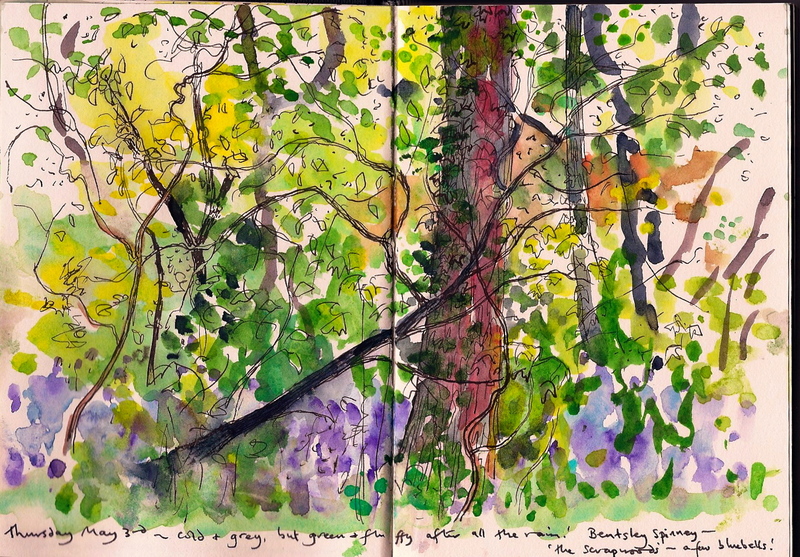 What I love about sketching is the sense of peace from just being outside somewhere quiet, and how even on the dullest of days the more you look at the subject the brighter and clearer the colours seem to get, the fresh spring greens and yellows, a few bluebells and the birds singing, lovely! Lovely and colourful, makes me want to visit it!